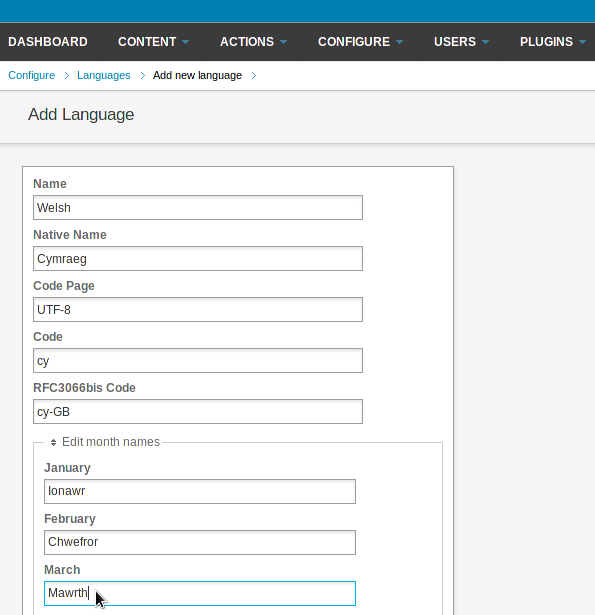 The Languages page enables you to configure support for languages that you wish to publish in. 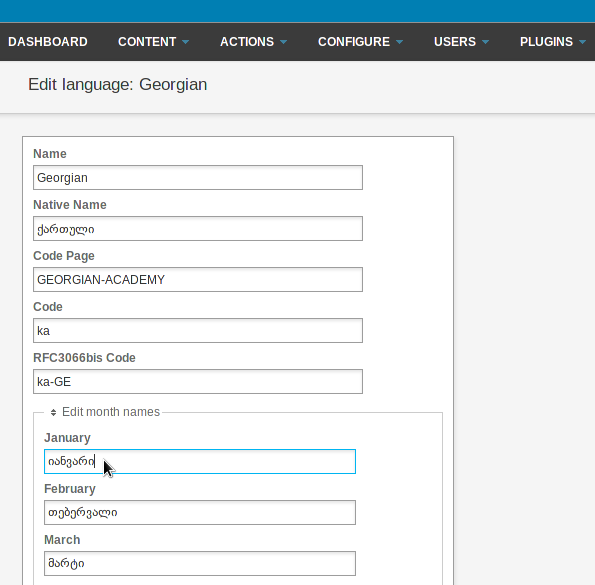 Click Configure on the main navigation menu, then Languages from the submenu, to see the languages currently available. The Code column refers to the two-letter ISO 639-1 code name for each language. English, for example, is en, German is de, Spanish is es, Russian is ru, and so on. Sometimes a country variant suffix is used, such as en_GB for English as spoken in Great Britain. The RFC3066bis Code column refers to similar IETF codes which are used for serving HTML content. Click on a name in the Language column to open a page for that language, which enables you to adjust month and day name translations. This feature ensures that automatically generated publication dates for an article in a particular language are displayed correctly to your international readers. Then click the blue Save button in the lower left corner of the page. 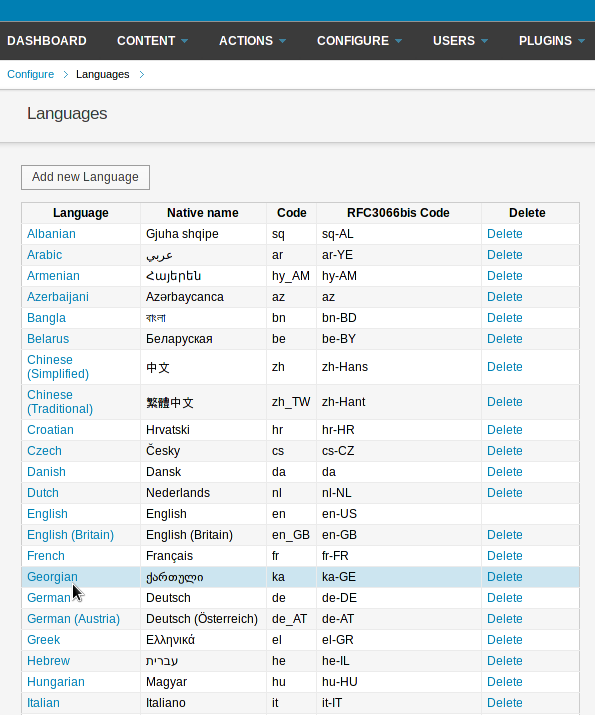 To add another language, click on the Add new Language button on the Languages page. Then enter the language name (both in your own language, and the Native name in the language itself), its Code Page (such as UTF-8 for the international character set), its ISO Code (e.g. cy for Welsh) and its RFC3066bis Code (e.g. cy-GB for Welsh). After entering translations in all the fields, click the Save button at the end of the page. The new language will now be shown on the Languages page. You may wish to limit the number of languages configured on your Newscoop server, in order to spare your editors and journalists from having to navigate long drop-down language menus. To remove a language, click Delete at the end of each row in the list. If there are any articles in that language in the Newscoop database, Newscoop will warn you in a pop-up alert that the Language is in use and cannot be removed.